Bird's Eye View of Nantasket Beach from Boston. Boston to Nantasket and Plymouth. This is an uncommon c. 1915 bird’s eye-view of Nantasket and Plymouth issued by the Nantasket Beach Steamboat Company. Captures the view of the Nantasket Beach as far as Plymouth, as seen from Boston. The bustling pier in Boston can be viewed in the foreground and a harbor full of ships and ferries travelling between its carious islands and cities. 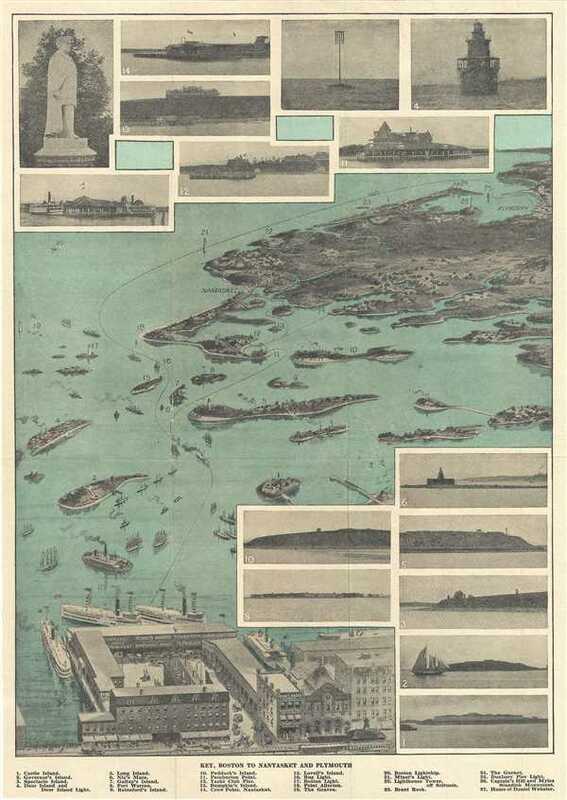 Includes Castle Island, Spectacle Island, Long Island and Peddocks Island, among many others. Identified several lighthouses including Boston Light, Minot’s Light. Bug Light, etc. Ferry routes are indicated. A key along the bottom margin identifies 27 locations marked on the map. The view also includes 15 photographs, some featuring images of the locations listed. This map was issued as part of the booklet issued by the Nantasket Beach Steamboat Company. The booklet, accompanying this map, notes ferry schedules, points of interest, photographs, and other information useful to the tourist for ‘day excursions between Boston and the far famed Nantasket Beach and Historic Plymouth’. Very good. Minor wear along original fold lines. Professionally flattened and backed with archival tissue. Accompanied by original 22 page booklet.